Galactus is starving and must consume a planet soon to survive. Using what little energy he has left, he comes to a very primitive planet compared to past planets he's conusumed. He figured his heralds should be able to prepare the planet alone with him nearly incapacitated. He then sends his heralds down to the planet to prepare his feast. If they don't succeed it will be the end of Glactus. For Planet Avatar to win, the 4 nations have to work together to destroy all 4 machines each herald will place. Each herald will place their device somewhere in their respective element kingdoms. Once a herald's device has been destroyed, Galactus can't rebuild it. The heralds win if they succfully feed the planet to Glactus of course. Why hasn't anyone commented on this? This is actually really interesting. My original thought was that it was going to be a stomp, but with basically, every available bender, I think they benders can manage, if only just. Essentially, the heralds are fighting the entire planet. Is each location going to have each type of bender? Are there going to be fire and earth benders in the water tribe? Or are the benders limited to their individual nations (In which case I would assume Aang would be stationed in the fire nation)? Alright, if I'm not mistaken, Terrax will land shortly before the others so he can make his big announcement. This would give Ba Sing Se time to send out a warning to the other nations. They will likely get help from the rest of the Earth kingdoms, at least the near by ones. With the full force of the Earth kingdom, they should be able to destroy the first machine, and even use their combined strength to take out the second. As for the rest of the nations, I'm thinking that thanks to the order of the White Lotus they'll get notice before the invasion reaches them, but only just. They'll know what's going on, but won't have time to properly prepare. The water tribe can pull through, their entire kingdom is a weapon (much like the earth kingdom), and they can succeed in bringing the full force of the ocean down on the device to manage to destroy it. Which leaves the Fire Nation. They seem to be the least capable of success as far their bending goes. However, combine with their military technology they can mount a strong offensive front. 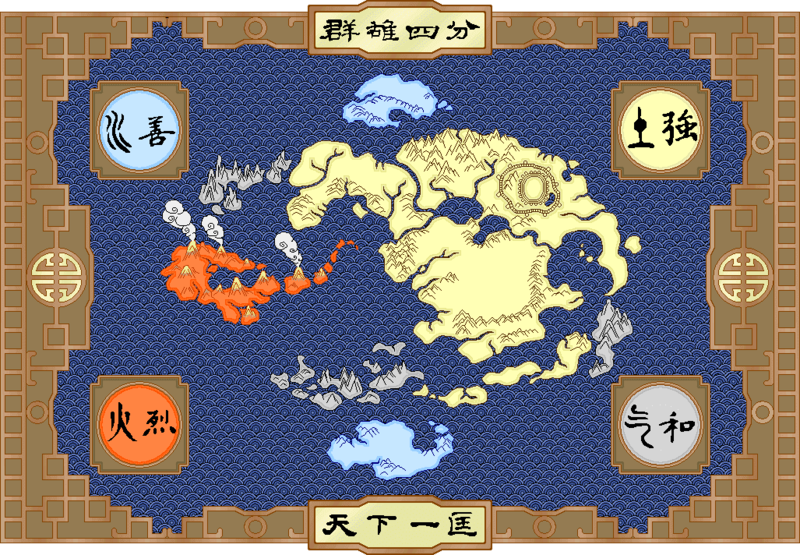 And, if I am safe in assuming Aang and co are still in the fire nation, that gives them at least one earth, water, and air bender. And if worse comes to worse, Aang's avatar mode can sure destroy the device. Don't forget about Air-Walker is in the Southern Earth Kingdom.